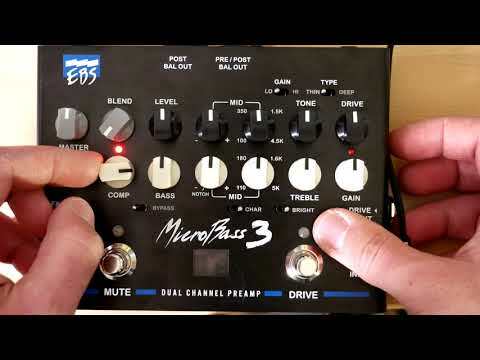 The EBS MicroBass 3 Professional Bass Preamp pedal. FREE shipping in the USA! 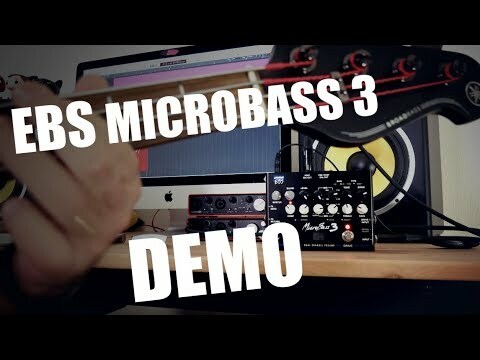 The EBS MicroBass 3 is a 2-channel preamp, built exclusively with premium components. It is engineered by EBS in Sweden with technologies from the famous HD360 and Fafner II amplifier designs. The preamp operates at a signal level equal to a professional mixing console (+/- 15V) which gives you plenty of headroom. The high signal level makes it suitable to use as a preamp in combination with any type of power amp. Run the Clean and Drive channels in series or parallel. Use the dual balanced XLR-outputs to tap the signal post and pre EQ at the same time. If you run the Effects loop in stereo mode, the balanced outputs become a Left and Right output instead. With 10 Mohms input impedance, it handles any type of bass – passive, active or with piezo pickups. 9V DC, 450 mA required (power supply not included).